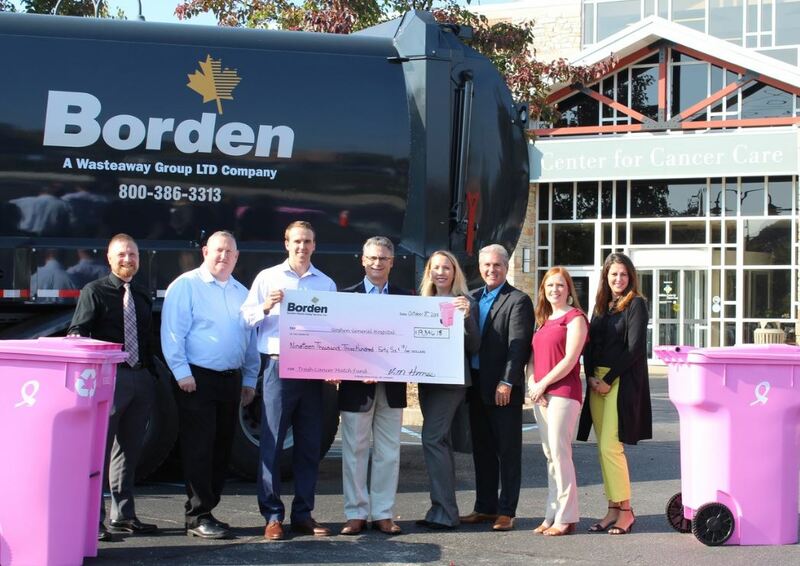 As Breast Cancer Awareness month is well underway, Borden Waste-Away Group met with Goshen Health Foundation to present fundraising proceeds for cancer research that is more far-reaching than breast cancer alone. In 2011, Elkhart-based Borden Waste-Away pioneered an exclusive program called the “Trash Cancer Matching Fund” where interested customers add $1.00 to their monthly bill as a donation for cancer research. Each year, Borden matches these donations dollar for dollar, with the combined amounts raised donated to Goshen Health Foundation in connection with Goshen Hospital in support forty-five active clinical trials. The clinical trials include a wide range of studies that includes breast, lung, colorectal, lymphoma, esophageal, head & neck, prostate, melanoma, multiple myeloma, pancreatic, and other cancers. Other programs supported includes preclinical studies for early detection, cancer vaccinations and improved radiation oncology verification systems, as well as The Tissue Bank. Including donation funding from 2017, Borden Waste-Away Group totaled an astonishing $19,346.18 during this funding period, for a 7-year total of over $160,800 dollars. To participate in Borden Waste-Away Group Trash Cancer Matching Fund Program, we want to encourage everyone to call Borden’s Customer Support Team at (800) 386-3313 ext. 570 to join in fight against cancer. Waste-Away Group, Ltd. manages waste collection, transportation, and disposal, both to our state-of-the-art recycling facility and local landfills for residential, commercial, and industrial customers. Having served Northern Indiana and Southern Michigan for over 70 years, Waste-Away Group, Ltd. is headquartered in Elkhart, Indiana. Its affiliate companies includes Borden Waste-Away Service, Inc., providing residential waste and recycling removal, Himco Waste-Away Service, Inc., serving commercial and industrial customers for waste and recycling removal, Integra Certified Document Destruction LLC, providing safe, secure destruction of sensitive material and hard drives, and Recycling Works, Inc., the Materials Recovery Facility that sorts and ships recycling commodities to the world market for reuse. Together, these companies making up Waste-Away Group provide innovative, environmentally sound solutions while maintaining a leading market share in its core business areas.